Leading British artist Fiona Banner presents an immersive installation exploring her ongoing interest in language and its limitations. In the sculptural performance Buoys Boys, five large inflatable full stops, each in a different font, float above the roof of the De La Warr Pavilion. 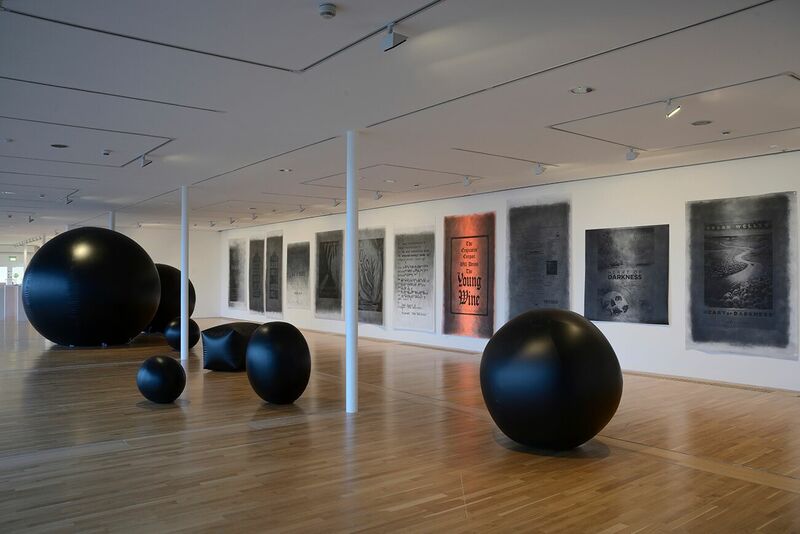 This series of happenings, which take place throughout the duration of the exhibition, are documented in the film, Buoys Boys, which is shown as part of Fiona Banner’s solo exhibition of the same name. When the giant inflatables are not floating from the roof, they are presented in the centre of the gallery. The full stop sculptures or “anti-texts” reference Banner’s concern with the limitations of language. Buoys Boys is set to the 1966 pop song Snoopy Vs The Red Baron. The track was recorded during rehearsals for two live performances of the song organised by Banner, one featuring Viv Albertine from English punk group The Slits, and the other with Sir John Cass School Choir in London. A series of large-scale posters that fill the back wall of the gallery also relate to Banner’s live performances, each with an intriguing story behind them. Ha-ha, installed along the full length of the gallery windows, punctuates the landscape – cut outs in the shape of more full stops. This work cleverly plays with the outside and the inside, the beautiful seafront and Banner’s interest in creating a ‘pause’. The entrance to the gallery is marked by Font (2015), a found 1920s marble baptismal font marked with its name: Font. It creates a playful slippage between naming, language, object and image – a recurrent theme in the artist’s work. Her book The Nam (1997), once described as ‘unreadable’, contains descriptions of well-known Vietnam films, is displayed on a plinth and represented as a giant sculpture as you walk further into the space. The Nam was published by The Vanity Press, which has been the backbone of Banner’s practice for the past decade. She uses the pejorative term Vanity Press to playfully refer to the practice of self-financed publishing for personal satisfaction. A flickering neon sign in the gallery depicts the ISBN number that registers the neon work under the title The Vanity Press. It is accompanied by routine paperwork from the British Library that asks her to submit copies of her published work. The reply she sends explains the impossibility of their request given the one-off nature of much of Banner’s published works. The exhibition is suitable for all ages. Buoys Boys was part of the ROOT 1066 International Festival in September and October this year where artists loosely responded to the cultural and legacies of the Norman invasion.